-Made in First inning by Walsh's Wildness and Dougherty's Error. CHICAGO, Sept. 23.- The deadlock in the American League championship race was broken in Greater New York's favor to-day by the narrow margin of 1 to 0, after one of the most brilliant pitchers' battles ever fought and before by far the greatest crowd that ever saw a baseball game on the American League club grounds. The attendance was estimated at 2,5,000. The only run of the game, which decided the League's lead, was registered only a fraction of a second before a lightning double play ended New York's half of the first inning. Walsh and Hogg were the centerpieces, and there was nothing to the game but their work and the fine and determined support given to them, despite the occasional misplays registered_ Neither team shone in the offensive department. The locals got but one clean hit in nine innings, a two-base hit into the crowd by Donohue. A mere scratch due to Hogg's failure to cover first base gave Dundon an unmerited single. The New Yorks touched Walsh's " eel " for six hits, which were scattered through as many different innings. With a little better break in the luck Eddie would likely have quit with a drawn game to his credit. New York scored its winning run right off the reel, almost before the big crowd had settled into place for the day, and no one realized its magnitude at the time. Keeler had rolled a slow one to Donohue at first, and had perished. when Walsh lost control of his " eel " delivery long enough to giveElberfeld a base on balls. Chase batted a single into left field, and knowing Dougherty's weakness, Elberfeld rounded second, dashing for third on It. " Pat " threw the ball to Robe in time to have it cut off Elberfeld, but the throw was bad, and before Robe could get the ball and touch the runner he was safe, Chase reaching second. With runners on third and second I and one out, the local infielders did not play in for some reason. When Williams hit a fast one to Davis he was thrown out at first, and Chase, who tried to reach third en the Out. was nailed by Donohue's quick and perfect relay to Rohe. 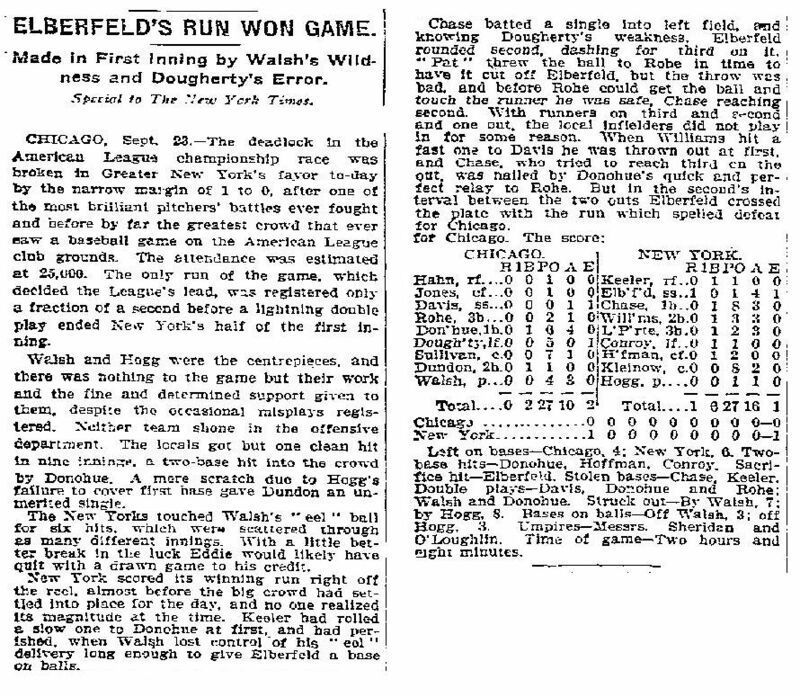 But in the second's interval between the two outs Elberfeld crossed the plate with the run which spelled defeat for Chicago.